Ultrasound imaging uses high frequency acoustic waves to generate images based upon echoes generated by differences in the acoustic properties of materials of which the sample is composed. The production of acoustic waves and detection of the resultant echoes is based upon the pulse-echo-principle. The acoustic wave is generated by application of an electrical current to a piezoelectric crystal, inducing mechanical stress and deformation (the converse piezoelectric effect) which in turn generates pressure waves (acoustic waves). After the acoustic wave has been generated the crystal switches to detection mode and awaits returning acoustic echoes. This cycle is repeated several million times per second. In practice 99% of the time is spent detecting echoes. Once the acoustic wave has been generated, it travels through media with which it comes into contact. The speed with which these acoustic wave travels through the sample is determined by the density and stiffness of the materials within the sample, with acoustic waves travelling faster through stiffer materials. Acoustic waves travel through human tissue at body temperature at approximately at an average velocity of 1540 m/s. When traveling through a medium the intensity and amplitude of the acoustic wave is reduced (attenuated). Thus echoes from deeper structures are weaker than echoes from superficial areas. The major source of attenuation in soft tissue is absorption, i.e. conversion of acoustic energy into heat, although reflection, refraction and scatter also contribute to attenuation. If the acoustic wave encounters a boundary between two different media, some of the sound wave continues to propagate through the tissue, while some of the wave bounces back towards the source as an echo (reflection). The angle of incidence is identical to the angle of the reflection. The acoustic wave propagated through the second medium (or tissue) is bent from its initial path (refraction). The angle of incidence will be different from the angle of transmission. The amount of deflection is proportional to the difference in the two tissues ‘stiffness’. Scatter occurs when acoustic waves encounter a medium with a nonhomogeneous surface. A small portion of the acoustic wave is scattered in random directions while most of the original acoustic wave continues to travel in its original path. 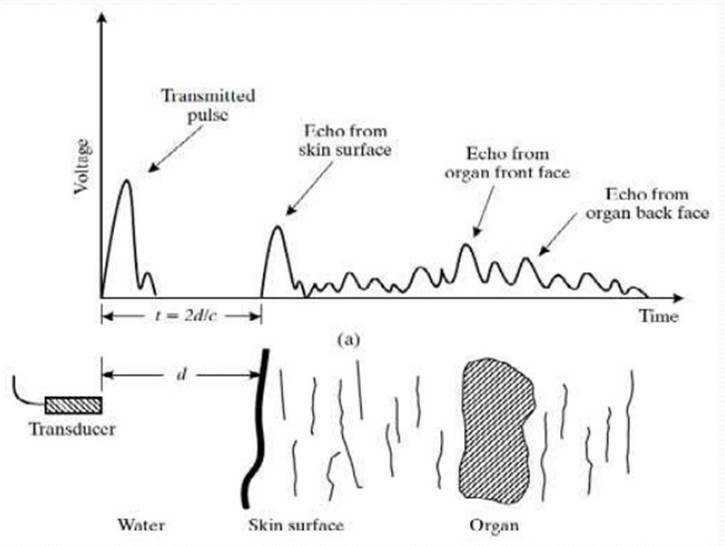 Reflection of the acoustic waves occurs at a boundary or interface between tissues with different acoustic impedance. Acoustic impedance is the resistance to the passage of ultrasound waves: the greater the acoustic impedance, the more resistant a tissues is to the passage of ultrasound waves. The greatest reflection of echoes back to the probe comes from interfaces of tissues with the greatest difference in acoustic impedance. For example there is a large difference between the acoustic impedance of air and soft tissue, and between the acoustic impedance of bone and soft tissue. Tissue and air and bone and soft tissue interfaces therefore give rise to very strong echoes, and produce what are termed hyperechoic images. Difference in acoustic impedance between various types of soft tissue, such as blood, muscle, and fat, are very small and result in hypoechoic images. Diagnostic ultrasound uses frequencies between 2 and 20 MHz. The frequency chosen depends upon the depth of the structures to be imaged the spatial resolution required. Lower frequencies are able to penetrate deeper into tissue but produce images with poorer resolution. In contrast higher frequencies will produce images with higher spatial resolution but reduced tissue penetration.